Lil Wayne sits down to talk about everything from making hits to earning degrees as he reflects on the evolution of his career. When the Hot Boys (Juvenile, BG, Lil’ Wayne and Turk) hit the scene in 1999 with “Drop It Like It’s Hot” they hit the ground running. They were young, brash and full of arrogance. At the time, the group provided a breath of fresh air for the hip-hop industry. They were four individuals from the south who bought the bling-bling from their region to the national stage. Eventually renamed “Cash Money Millionaires” the group’s name epitomized their style and attitude. Although Juvenile was the front-runner, there were other group members who warranted attention as well. One of the youngest group members was Lil’ Wayne. At the time the hip-hop world was so taken back by his youth that many people did not realize his lyrical ability. Fast-forward to 2005 and Lil’ Wayne is now a veteran in the hip-hop industry, 23 years old and working on his fifth solo album. Lil’ Wayne describes himself as always being a go getter. He was signed at eleven years old and put out his first album at twelve. Then came instant success with the hit “The Block is Hot” (1999) which was also the title of his album. With the new found stardom following his first album, Lil’ Wayne did not rest on his laurels. The following year he came out with his second album titled “Lights Out.” His third album titled “500 Degreez,” which debuted in 2002 was also a success. That album powered by the single “Way of Life” sold impressively. During this time, however the Hot Boys disbanded with Lil’ Wayne the only member of the group retained on the Cash Money label. 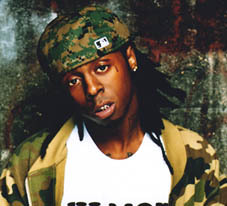 Consequently, Lil’ Wayne rewarded Cash Money for their support with the hit single “Go DJ” on his fourth album titled “Tha Carter.” Now with his fifth album Lil’ Wayne is as ready as ever to move up to the next level. Even with his modest bling, tattooed tear-drop and dreadlocks, Lil’ Wayne looks as if he has fully arrived and living the American Dream. With his calm and comfortable demeanor (the blunt was in the ash tray), he talks about his past achievements, present projects and future expectations. Surprisingly, he is quite forthcoming with moments of introspection and reflection. First he announces he is super confident about his fifth album “Tha Carter ll.” In addition, he admits that because it is his “fifth time around” he has no worries. “I have a lot of new music on [the album] and a lot of new production so it is a new sound,” states Lil’ Wayne. “I’m still a go getter and I am going to make [my album] do what it is supposed to do.” If anyone is doubtful about his confidence, Lil’ Wayne has already sold over ten million records in his career. Now Lil’ Wayne is embarking on a new chapter in his life. As a young adult, Wayne attests to the fact that the pressures of being solo is “thicker” because when you are part of a group you can always put the blame on someone else. However, when you are by yourself you have to personally deal with situations. Over the years Lil’ Wayne has learnt to deal with situations. As maturity kicks in with anyone, some friends stand the test of time while others do not. It is no different for Lil’ Wayne. When asked whether he still keeps in touch with any of the Hot Boys, Wayne states, “Nah, I just keep in touch with Money.” Nevertheless Wayne has made new alliances in the hip-hop industry. Working with artists such as Bobby Valentino and Destiny’s Child has helped Wayne expand his horizons. When asked about this new progression, Lil’ Wayne does not hesitate. “It is always an honor and when I am there I have to do what I have to do,” Wayne adds. “Everybody knows they would not call me if they knew [my music] would not sound good.” Wayne stays focus making sure this attention never goes to his head. “Having people pay attention to me is cool but I want more people to call me,” says Wayne. “I want to be on everybody’s single.” In his view his evolution was “natural.” The man child has come of age. Q: There is a rumor that Mannie Fresh has left the label? A: Yeah, he is gone. Ain’t any bad blood. I am not even worried about blood. I am worried about money. If we aren’t getting money then we aren’t getting anything. Q: Who does your music now? A: On this album, I have Cool & Dre from the Terror Squad, Big Dee from Miami, Heatmakers, Clue, Develop from NY, Young Yani from Mississippi and two new in-house Cash Money producers Diesel and T-Mix. Q: Where did the Def Jam rumor start? A: I just had a conversation with Jay Z. People got the misconception and thought that I was going over there. Q: Were there any plans to go over there? A: Nah. I am fulfilling my plans right now over here. We hollered at each other. Q: How was that experience talking with Jay? A: I wish it could have worked out but I think everything happens for a reason. I look at it as a highlight of my life personally. I don’t know what [Jay] might think about it but that is what I think. Q: If you could do a song with any rapper who would you want to do it with? Q: Most people do not know that you are in school. Are you still going to the University of Houston? Q: What are you studying? Why? A: Psychology. I went actually for sports management but I would have to wait two years to take that course but psychology I was able to jump right into it and study what I wanted to study. Q: Now that you are studying psychology, do you think that the tragedies you have experienced in life like the passing of your father have influenced your decisions? A: Life period. And that is not just for me it is for anybody. When you are making a decision it is like you are asking yourself what am I about to make my life into. What am I about to be? What’s my career, my goals in life and my future? When I did decide to study psychology I realized a lot of my life experiences were influenced by my choices. I felt Psychology was something that I could do that could help me and when I finished with it, I felt I could do something with it. Q: Is there any particular message that you are trying to give out in this album? A: Only message that I am trying to give out is that I am good. Q: What is your favorite cut on the album? A: Right now, the intro because it is like a five minute track but it is like five minutes from the beginning to the end. No hooks. It is just me going crazy. Once you hear the intro to the album you’re probably going to say to yourself that you don’t need to hear more because it explains everything and answers every question. Q: When people listen to you ten years from now what would you want them to think? A: Just raw and talented. What I mean by raw that is I’m willing to say and do anything that makes sense to me as long as it is a reflection of me. And talented…just creative. I want people to think of me as creative because I try hard. Q: How long do you plan on doing this? A: This here is my fifth album and I am going to do eight albums. A: This is “Tha Carter II” right here and I feel like I will be done when I am 25. I just turned 23, next year y’all will get “Tha Carter III.” At 24 you will get “Tha Carter IV” and at 25 “Tha Carter V” which will be my last album. By then school will probably be at it’s peak and I will be trying to focus on what I will be doing with that. Q: You have a label. Who is on your label? A: I have Nikki a singer from Ohio, Dizzy from New Orleans and MacMain from my hood and I have my first artist that’s up out the gate Currency the Hot Spitter, a former No Limit artist. His album will be coming out next March. Q: Who are the main artists for Cash Money? A: You have Six Shot, Tina Maria, Lil Mo and Kiki Wyatt. My man Six Shot is a rapper but Stunna (Baby) and I are the main rap artist. Stunna (Baby) probably isn’t going to be doing this too much longer. Q: Why a lot of east coast production on the album? A: Those were the people I got CD’s from and I ended up hearing what I like. Q: How are you are guys doing after Katrina we heard a lot of cribs and cars were messed up? A: We are good, the death thing is the most important thing and that’s what hurts the most. As for as cars and cribs we are Cash Money millionaires. Q: What type of females do you like? A: I like thick Miami women. Q: One time you boasted about being with a thousand women what is the number now? A: Stop it. I still keep track of it. Honestly, now that I have gotten older the number really doesn’t move too much. Now I find someone to chill out with. Q: You have a lady? A: Money is my young lady. Q: Have you seen BG, Turk or any of the other members? A: I have seen BG recently. We always end up in the same city doing shows. Turk I hollered at a few times. As far as Juve I haven’t seen him in a while. Recently, I’m the newest member of Boyz N Da Hood. Young Jeezy is no longer part of the group. They just added me and maybe T.I. We are coming with an album and a mixtape in May. I just made two joints last night. Q: Considering you guys were the pioneers what do you think of the direction the south is moving? A: I like what the south is doing. I don’t want it to represent us though. The wave that is swinging out right now isn’t getting respected lyrically. It’s getting respect because the songs are hot, the tracks are hot, the videos are hot and the ideas are hot. I look at the game, and lyrically I spit. There really isn’t anybody else. The only dude giving me some comp because Jay doesn’t rap any more is Nas. If this would be a game Nas would be the dude on the last board. I not going to front I will have to practice a lot to beat him but one day I will beat him and when I do I will save it on my memory card. Q: So are you talking about lyrically battling everybody from east to the south? A: I’m talking about going straight to the last board. It wouldn’t make sense to play with anybody else because they can’t check me. Q: What about you and Ludacris? A: He’s a great lyricist but I don’t think we’re on the same level. I think a battle with him wouldn’t be a battle it would be two rappers rapping. Luda isn’t about to say what I’m going to say. It’s all about your opinion of what you think is a great rapper. I’m not just talking lyrically, I’m talking about what you say and how you say it, the full package. You can give me a list of words and the way I say them you will be like that cat is hot. It’s what you are saying and the feeling you get once the song goes off. Q: What do you think of the idea of artist making simple lyrics to appeal to today’s fan? A: The funny thing you said that because making the newest album I analyzed my past albums to find out why I wasn’t getting the attention of people up north. Honestly, my answer was to make my stuff simpler. Our slang the way we say it can be hard to understand. So therefore in a spot where I would generally use slang I just used a regular word. Q: Why do you think fans like simpler lyrics? A: As I grew older, I like simpler music because it’s fun and gets to the point. In reality that’s real music, I think if you start to make it too complicated that’s personal. This is not your testimony or poetry or your biography. Q: What was it about you at 11 years old that made you know this is what you wanted to do and what advice do you give to others who want to get there? A: My motivation is that I always knew that I was good. I always knew that I was good enough. I compared myself to what I was listening to and I always thought that I was there. I always had that thought and that feeling so anything else would be wrong.